Time for a new challenge over at Fussy and Fancy ... the theme is 'Be my Valentine' and it's even more exciting because it is being sponsored by Marianne Designs, many of you will have some of their gorgeous dies, so why not get them out mix them up with some of your other crafty stash and give this challenge a go. I was wondering what to do for this challenge as at my age I do not receive or send Valentines cards as I have been married to my valentine for over 38yrs and we knew each other 4yrs befor that. Anyway that's enough reminiscing, as I was saying before so rudely interrupting myself, I was reading the Craft Stamper magazine and Elizabeth Dark had written an article about flocking her background, it looked so lush I decided I had to give it a go. I painted my MDF heart with black gesso and let it dry thoroughly, then I stamped the freebie rose stamp with versamark (previous experiment on black card taught me not to do too many at a time) then I sprinkled with Stampendous Stamp & Bond, heated it gently with my heat gun till it became clear then sprinkled with Stampendous Fuzzy Fun Flock (chilli pepper red). The instructions said gently rub in with your fingers ... it was a very strange woolly feel but once the loose stuff was swept onto a spare piece of paper it revealed a lovely raised texture so covered the whole of the heart. I had bought some chunky small MDF LOVE letters so painted them with red acrylic paint and played about with the positioning. 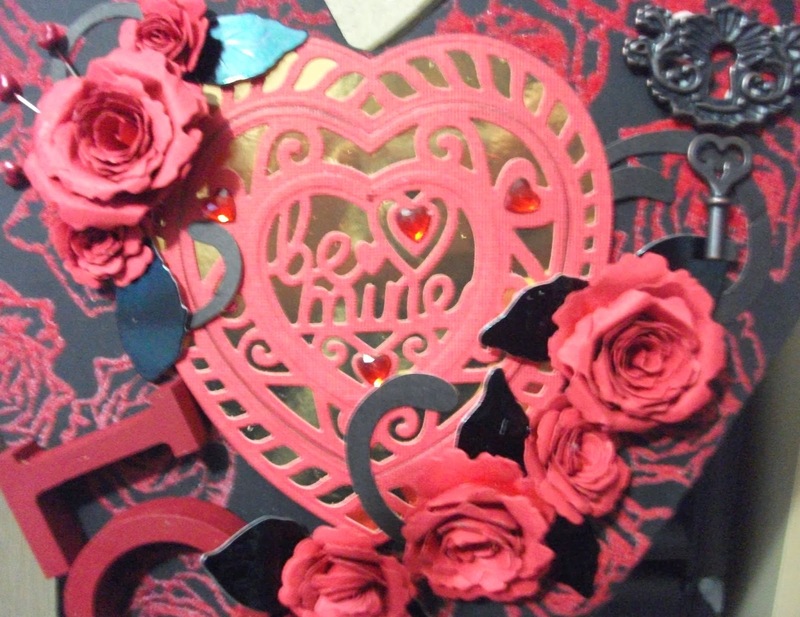 I die cut another heart with the message 'Be Mine' mounted on mirri board then did my favourite thing .. made some red paper roses with black foil leaves added some heart topped pins and a lock and key, then threaded some red ribbon through the holes and I was done. Now who is going to receive my love token .... hubby would be scared out of his wits :) as there is no other Beau I will have to hope one of the granddaughters will take it off my hands :) . Still I really enjoyed this frivolous project ... why don't you give it a go ... use any of your favourite techniques, stamping, decoupage, altered Art in your favourite style ... go to: http://fussyandfancychallenge.blogspot.co.uk/ you'll find details there and linking & uploading your project couldn't be simpler, well if I can do it anyone can. We really would love to see what you come up with .. I find entering these challenges makes me try things I have never done before ... you might surprise yourself. This is a BEAUTIE Annie!!! I LOVE the red against the black...everything just POPS!!! Hope you enjoy a lovely weekend!!! Omgoodness Miss Annie~~This is FANTASTIC!!! I have never flocked before....another try it out for me:)) Thanks for your sweetness....always appreciate visits!! Great project! WOW, ANNIE!! 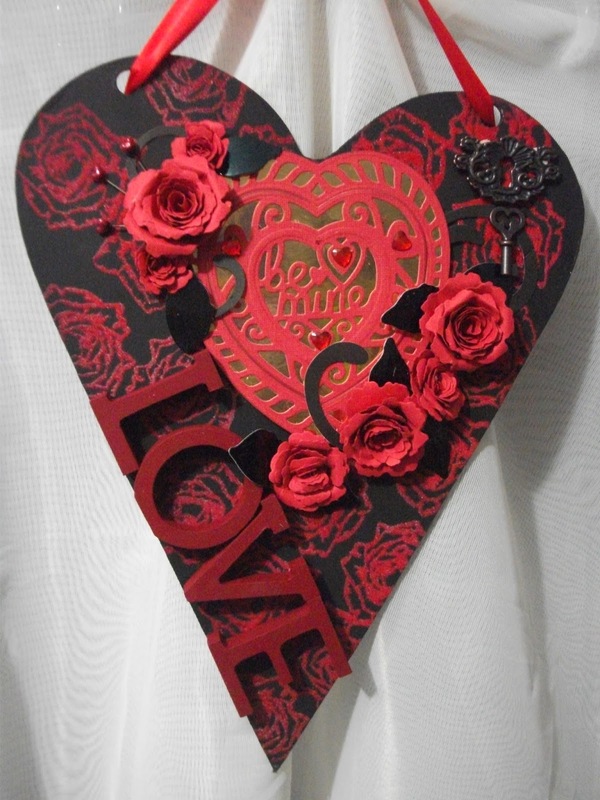 I was eyeing your gorgeous red roses with the black back ground and was wondering what you used, when I saw this gorgeous heart on our DT BLOG! I never would have guessed that it was red flocking that you did yourself! I am so very impressed! I love that you are always interested in trying brand new techniques! How fun! I absolutely LOVE everything about your gorgeous and very elegant heart! The fancy die cut and those gorgeous paper roses that you made! I have to say, though, that I really love that gorgeous flocked red and black background! You really did an outstanding job explaining exactly how you did it too! What a wonderful write up for our followers! Gorgeous effect of this heart Annie love the look of this technique.